These are three more images from the little golden sketchbook I wrote about in my last post. Taking a subject & simplifying it with a few lines & adding a haiku-inspired poem keeps me focused on what I see as the subject’s pure essence. 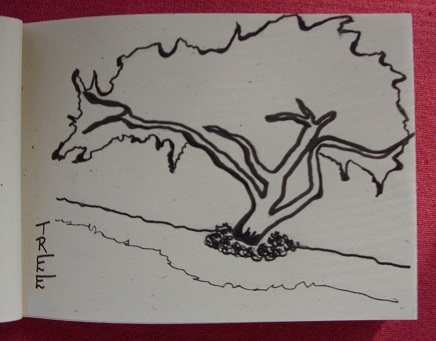 The first drawing is a tree planted in the middle of a path. While people ignore it as they walk around it, I imagine the tree eagerly waiting for someone to say, “Hi.” The second drawing is one of my favorite nearby spots with an amazing view. 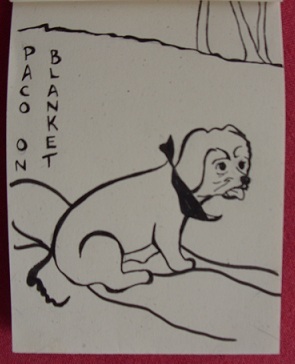 The third is my blind dog, Paco, who can safely explore the fenced-in area of the doggie park, while I watch him lovingly from my blanket stretched under a shady tree. 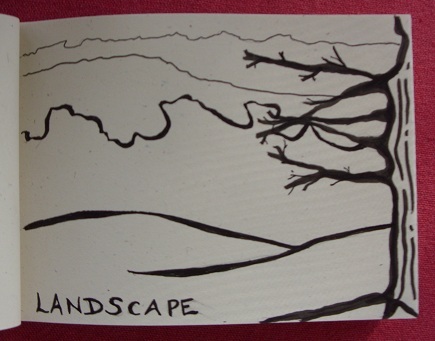 This entry was posted in A Window on Life, Art and Soul, My Love for Nature and tagged art, creativity, dog, earth, haiku, inspiration, life, love, nature, poetry, tree by puresusan. Bookmark the permalink. Great job with the art as well as the poetry! Poor Paco!! He’s lucky to have you. Thanks on both counts. It’s been fun to try something new. And yes, Paco is lucky… but I am, too. Gotta love the pups.